Bring outstanding Infinity sound to your boat, ATV, or golf cart with the powerful, versatile Kappa 4100msb marine soundbar. Bluetooth® connectivity, plus 3.5mm and RCA inputs, lets you stream all kinds of music, while the built-in amp pumps out 240 watts of power for awesome sound. This soundbar features four long-excursion 4" speakers and a pair of high-output 2" tweeters, so there's plenty of volume on tap. If that's not enough, two sets of preamp outputs let you add additional amps and speakers or even a subwoofer to your system. 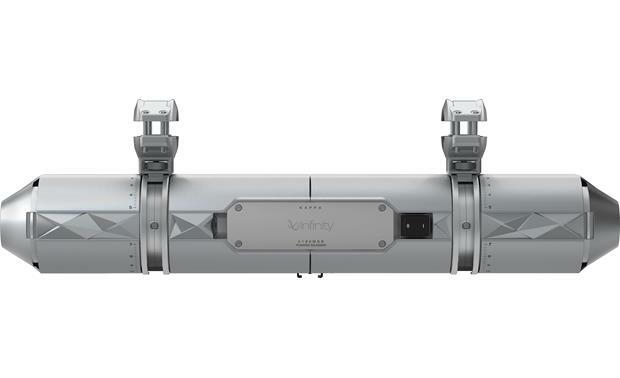 You can also use the Infinity 300ke separation kit to separate this soundbar into two separate tower speakers. That kit, which is sold separately, includes a 9.8' umbilical cable, along with rear and bottom filler plates. The ultra-efficient Class D amp kicks out 120 watts to each channel, and includes intelligent priority switching so it's easy to connect and enjoy your various devices. The 3.5mm jack overrides the Bluetooth, which in turn overrides the RCA inputs. That simplicity will come in very handy on the water or on the trail. The Kappa 4100msb's versatile mounting system allows you to install it on a vast variety of roll bars, wake towers, and cages. The system includes universal mounting clamps, inserts, and quick-release brackets. With "Party Mode," you can simultaneously connect up to three Bluetooth devices and share DJ duties with your friends, streaming from the device most recently selected while you pause the other two. The detachable RF remote lets you control your music from wherever you are, and there's even a GoPro shoe, so you can mount your action camera and capture all your biggest moments. The KAPPA 4100msb is made for the outdoors, with an IPx6 weatherproof and splashproof rating. 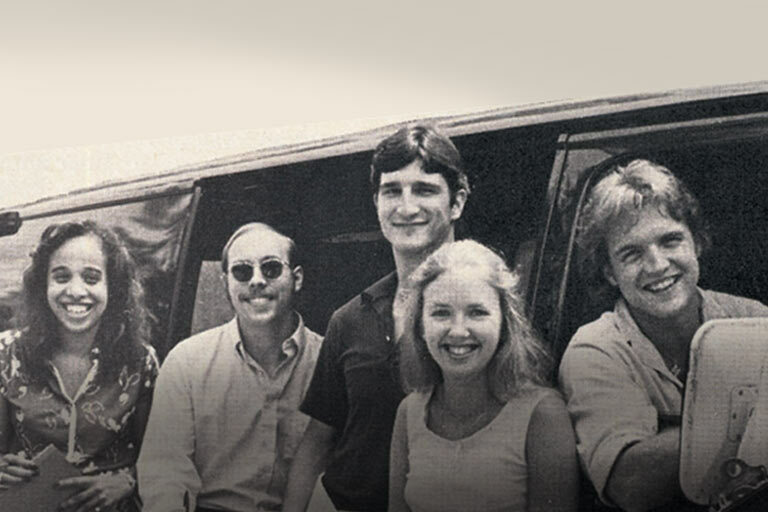 It'll stand up to whatever you can dish out and keep the music going the whole time. You'll also appreciate smart features like a glowing red front-panel LED display that flashes in time with the music and a dual-level LED light that'll be a big help when you need to consult a map. This soundbar is even future-proofed, with a micro USB connection that you can use to install Infinity software updates. 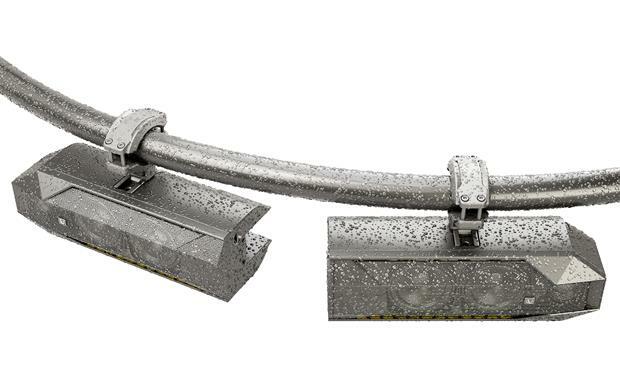 dimensions: 31-1/2" x 6-1/8" x 5"
The Infinity INF4100MSBSIL is offered in a silver finish. For more details or to discuss further, feel free to contact an Advisor directly by phone (888.955.6000) or online chat. Thanks! IPX6 Rating: The Infinity Kappa 4100msb amplified powersports soundbar is water resistant with an IPx6 rating. 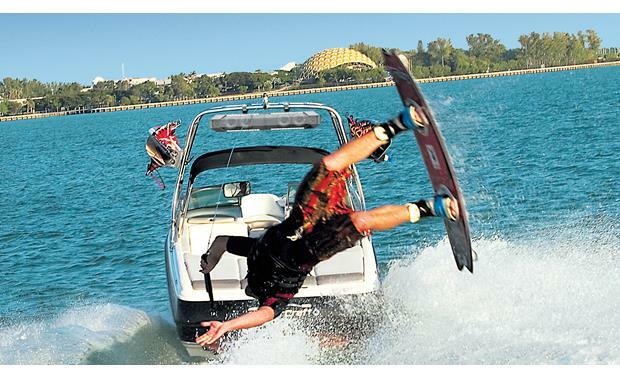 It can withstand powerful jets of water, but should not be submerged into water. 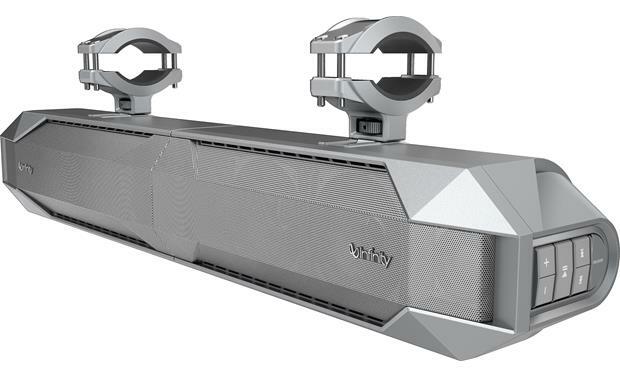 Full-Range Separable Speaker System: The Infinity Kappa 4100msb's high performance speaker array consists of a pair of 4" long excursion mid/woofers and one high output tweeter per channel. 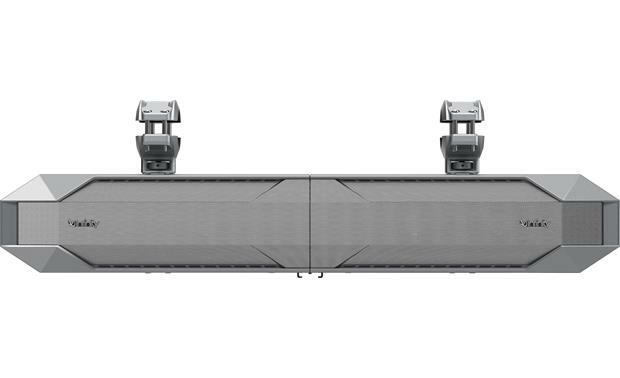 The Kappa 4100msb can also be separated into two speaker towers utilizing the optional Infinity 300ke separation kit (108300KESI, sold separately) which includes a 10' (3m) bridge umbilical cable and rear and bottom filler plates. Class D Amplifier: A high-efficiency Class D amplifier delivers 80 watts (RMS) per channel for loud, dynamic sound that is suitable for the outdoors while on the trail. Source Inputs: Equipped with Bluetooth, 3.5mm, and RCA inputs, the Infinity Kappa 4100msb includes intelligent priority switching to greatly simplifying the user interface by completely eliminating manual source selection. The 3.5mm jack overrides Bluetooth, which overrides the RCA inputs. Bluetooth Audio Streaming w/ Party Mode: The Kappa 4100msb is equipped with built-in Bluetooth for wireless audio streaming (A2DP) and basic control (A2DP) of stored music and music apps on your Bluetooth source device. Party Mode provides simultaneous connection of up to three Bluetooth source devices, while playing music from one device at a time. Audio will stream from the device most recently selected and pause the other two connected Bluetooth devices. 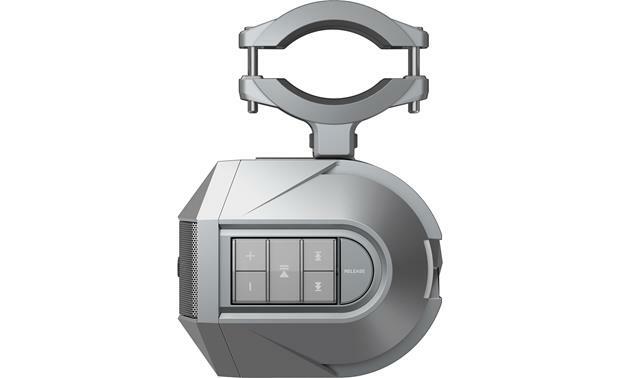 Dual Aux Inputs: In addition to wireless Bluetooth connectivity, the Kappa 4100msb is outfitted with 3.5mm and stereo RCA Aux inputs. If your source unit doesn't have RCA outputs, you can use the supplied speaker-level to RCA adapters to connect the source unit's speaker wires to the soundbar's Aux input. There is an input level switch (High or Low) based on what type of connection you use, plus a gain control for the Aux inputs. Detachable RF Controller: A detachable RF remote gives you control over your music wherever you are without having to aim the remote at the soundbar. You can control volume of your Bluetooth and Aux audio sources. You can control Play/Pause and Previous/Next Track functions of your Bluetooth source device. Audio Output: Full-range stereo RCA outputs enable you to expand the sound system with additional components such as a powered subwoofer or amplifier. Built-in LEDs: A glowing red LED display across the front panel flashes in time with the music. Plus, a dual-level LED light makes a perfect work light for reading maps or executing other on-the-move tasks. Auto Turn On: You can setup the soundbar to automatically turn on when it receives an audio signal from a Bluetooth source or either of the Aux inputs. Protection Circuitry: The power/protection LED flashes when amplifier shuts down due to over-current, over-voltage, over-temperature, or DC offset. 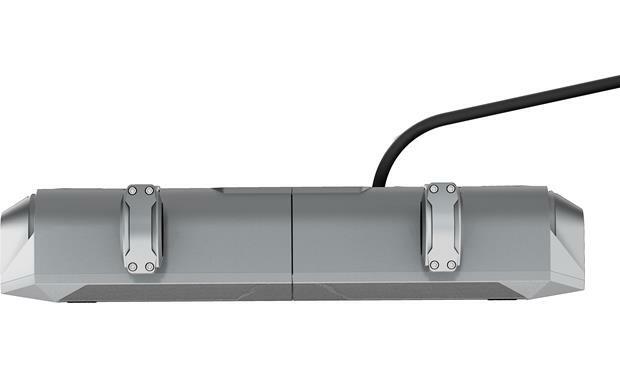 Flexible Mounting Options: The Infinity Kappa 4100msb utilizes a versatile mounting system with universal mounting clamps, inserts, and quick release brackets that offers easy installation and multi-mounting options. The mounting clamps support 1" (25mm) to 3.5" (89mm) diameter pipes. Attached Power & Ground Cable: The attached 9' power & ground cables will need to be connected to your vehicle's battery and chassis. You will need to install a fuse holder and 30A fuse between the power wire and battery connection. microUSB for Firmware Updates: A microUSB connection is provided to future proof the Kappa 4100msb with software & firmware updates. Searches related to the Infinity INF4100MSBSIL Amplified marine/powersport speaker bar with built-in Bluetooth®.